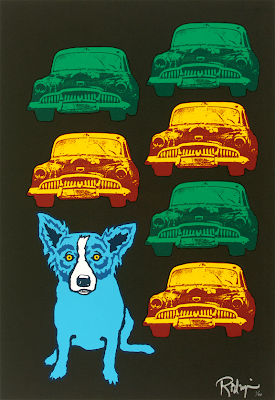 When I first met George, he carried his paintings around the country in a blue van. 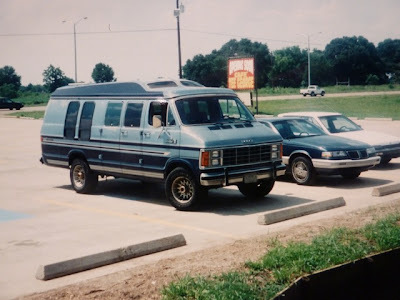 I remember riding in it after New Orleans By the Bay in 1992, from San Jose, California to Carmel, driving down Hwy 1, his kids watching television with headphones in the back, and Roy Orbison accompanying our conversation in the front. Like his other cars, the blue van stars in many stories, such as the time Bud Petro’s suitcase (with leisure suits) was stolen out of the back, prompting a near break-up of their friendship, or the time a tank-like vehicle pushed the broken-down van out of the Holland tunnel, leaving George stranded alone in a questionable section of New Jersey. 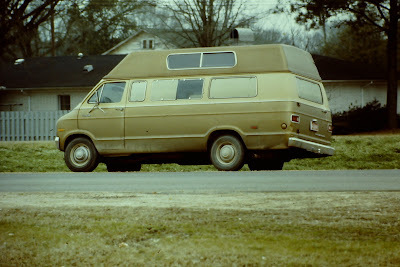 Before the blue van (and long before me), there was the gold van. George was famous among his friends for altering his vehicles to suit his needs (I believe today they refer to it as, “pimp my ride.”) In the case of the gold van, he raised the top. “I wanted to walk around in it,” he said, annoyed with my dumb question. 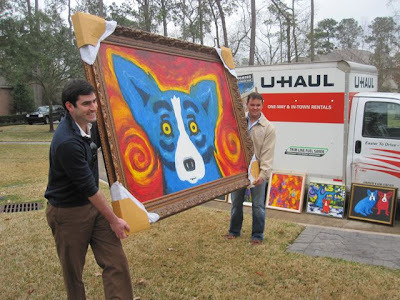 At one point he drove a Mercedes turbo-diesel, pulling his paintings from the trunk for clients in Houston, Jackson, Birmingham, and Shreveport. And in a way, some things never change; they just get better (or rather, bigger), if you consider his recent trip to Houston, visiting clients in a U-Haul. 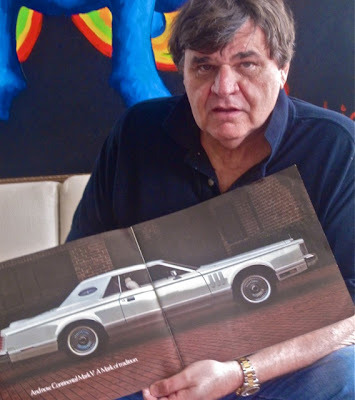 Never was George happier with a car or more suited for travel, however, than with his 1977 Lincoln Continental Mark V. It was, without a doubt, his dream car. (pictured, George today holding the Mark V’s brochure, on permanent view in his studio’s curio cabinet). 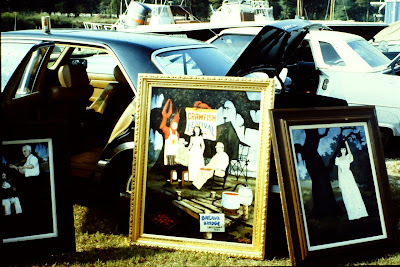 To fit larger paintings, he removed the backseat and cut out the struts (between the seat and trunk) to slide large canvases easily from the trunk to the front seat. He rigged a TV under the dash, and beneath that a ‘particularly cool CB’ (his words), made to look like a telephone. Did you have a handle? One trucker asked if she was east or west bound. Then another for her mile marker. Before you knew it there were ten guys asking to buy her coffee or a beer. 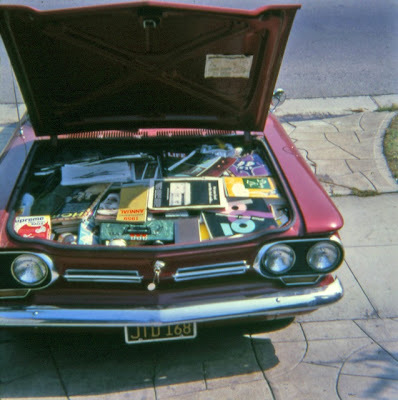 I’ve written before about George’s daddy’s truck (George’s first ride), which said “Rodrigue’s Portable Concrete Burial Vaults” across the side, and the ’62 Corvair that took George back and forth on Route 66 between New Iberia, Louisiana and art school in Los Angeles. 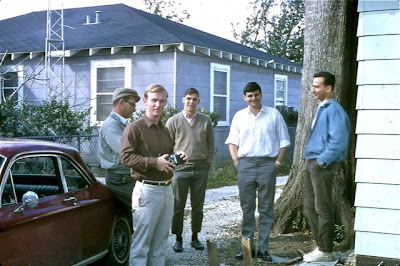 (pictured below in New Iberia with his buddies and packed for the forty-hour drive to school). 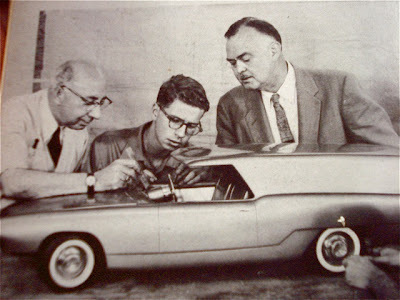 The Art Center College of Design in Los Angeles was known for automotive design, and George was in heaven as a student, even considering this as a career. I’ll never forget one night maybe twelve years ago, not long after we were married, when I awoke around 3 a.m. to find George lying over a large piece of paper on the floor of our bedroom, with a flashlight in his teeth and a pencil in his hand. 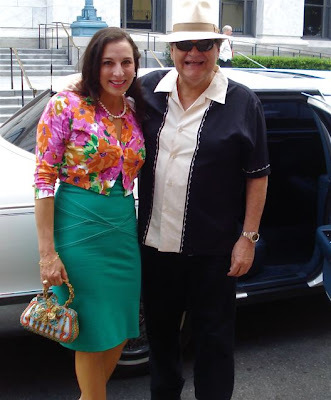 (pictured, George the driver with my friend Nancy Broadhurst, in front of our limo, after he dropped us off for Nancy’s birthday party). 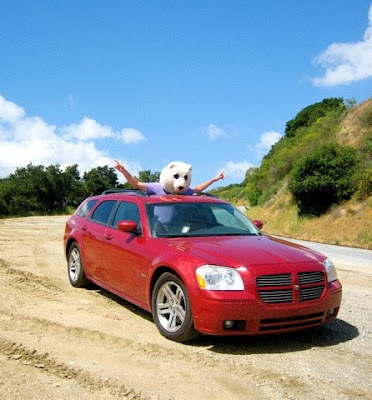 In California we keep a Dodge Magnum, which just may be George’s favorite car (pictured below with Jacques Rodrigue as Bear Head). He got it from a flooded car lot following Hurricane Katrina. (The bear head thing too runs in the family. Jacques’s brother André drove around Lafayette, Louisiana for years wearing a football helmet). 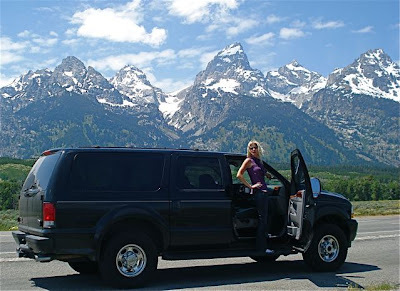 Once the blue van died (at 130,000 miles), George bought an Excursion, amplifying its politically incorrect status with a pumped up engine, bigger wheels, and all kinds of extras. Without a doubt, this truck, now with 140,000 miles, is our living room on wheels. We use it for one thing only ….to cross the country… something we do at least twice every year. 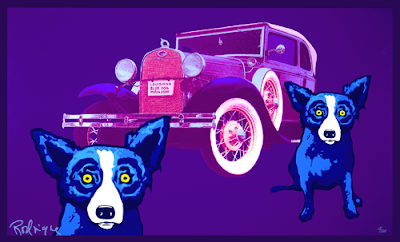 Here's a little something special for you, George --- a story about your cars. As we find more pictures, I’ll fill them in. 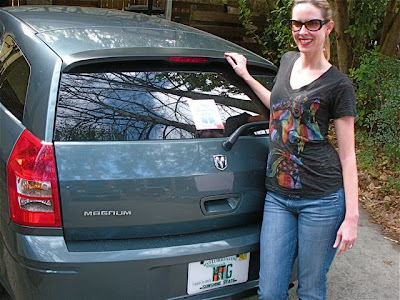 I wish we had a picture of Aunt Lois' (and later yours) Chevette with the "Honk if you love Jesus" bumper sticker! Come see us next time you're in town - we're doubling in size and our new addition is nearing completion in May. Sincerely, Dr. Gerd Wuestemann, exec. director, Acadiana Center for the Arts. Phenomenal Story! Happy Birthday, George. From your friend on Desire Street. 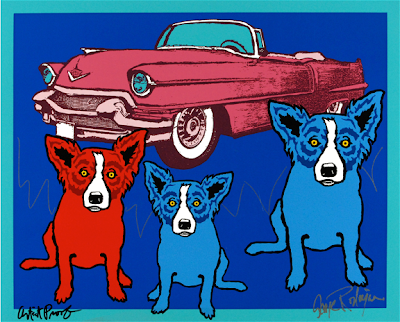 Painting the cars makes the cars hot and makes us to fell the colour of cars. 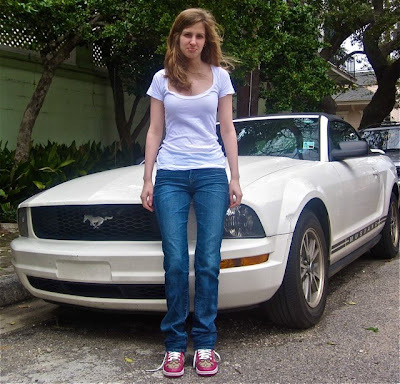 Very touching--there is something quintessentially American about a love affair with cars! Loved that story. Happy birthday! Didn't realize I had so much in common with George with regards to cars and ingenuity. Happy to learn that. Happy, happy birthday George from your friends Cher and Gar from Clarendon Hills, IL.